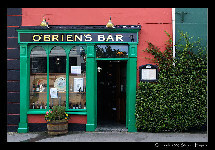 Wife Patricia had visited Ireland for the first time only a few months earlier in 2003. When a University of Chicago "Alumni College Abroad" opportunity presented itself for August, we quickly signed up. The group was small and very congenial, our lecturers excellent, and our UofC faculty companion and lecturer, Rory Childers, was not only highly valuable for his knowledge but a perfectly charming individual to boot. As a bonus, he is the grandson of Robert Erskine Childers (1870-1922), Irish patriot and writer (he wrote The Riddle of the Sands), who was executed in 1922 (during the Irish Civil War), and the son of Erskine Hamilton Childers (1905-1974), fourth (and much beloved) President of the Republic of Ireland. 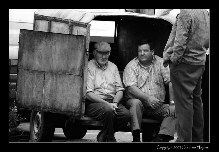 I tried to limit myself to "art" photographs, which of course was impossible, but what you see below is a culling of a large number of photographs, evocative at least a bit of Ireland. Where sodden is usually the air. For Ireland to be any less fair. As this simple limerick suggests, we had seven days of virtually uninterrupted sunshine, unusual under any circumstances but definitely welcomed (by us and especially by the Irish, who had suffered seven days of downpours just the week previous). Sunlight and shadows. Six photographs taken mostly from within buildings through their windows. Top row: windows and arches at ruins of the Ennis Abbey. Middle two photos: sunlight on tables and view through a window in Knappogue Castle. 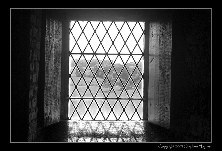 Bottom row: views through two windows in W.B. Yeats's homey little 16th century tower (Thoor Ballylee). 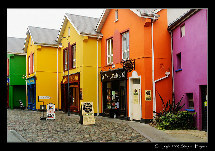 A collection of Irish town shops. 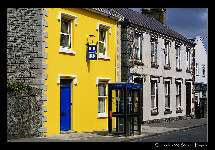 We were told that the farther one drives west in Ireland, the greater the tendency to paint walls and shopfronts with bright colors. 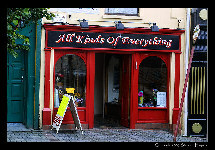 Not to mention the Irish names frequently to be seen proclaiming the shop's owner. We ferried over to the Aran Island of Inishmore. I was taken by the row of fishing trawlers docked as we departed. 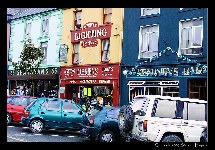 We spent an afternoon in Galway City. Others shopped; a few found the streetside cafés too tempting to resist. I parked myself in the shade along a street and photographed people strolling in the wonderful sunshine. 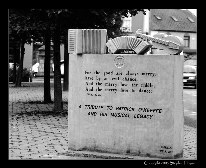 (Photographed near the Spanish Arch, for those familiar with Galway.) Click the image to see the montage. 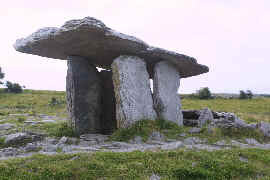 The Poulnabrone Dolmen is one of Ireland's great archeological treasures. Click the image to see the montage. The Blue Door. This wonderful combination of color, set amidst the drab gray of surrounding buildings, caught my photographer's eye. In Ballyvaughan. How can you not love a country that honors its beloved musicians so? Patrick O'Keeffe was a fiddler in Castleisland who died in 1963. The town apparently holds an annual traditional music festival in his honor.